The E400 at low speed (yes this is the twin turbo gas V6) sounds terrible akin to a quieter version of a diesel Ford F-150. Almost embarrassing they could not quell some of that or change the harmonics to not sound like an old motor. Run flats are a let down. Wish we had the option to swap for space saver and conventional tires. Run flats are clompy over bumps especially lower speed bumps unbefitting a Mercedes. I have the gorgeous 18 inch AMG star wheels btw so not crazy big. However, the suspension tuning is perfect. Not floaty at all yet not too stiff either which mitigates some of run flat harshness. With regular tires the ride would be nirvana. As far as I can tell we have no option for acoustic glass so I assume my car does not have it. It's pretty quiet though on highway if not exceptionally so. The bottom line is the tires are acceptable but not ideal. I'm coming from an Audi A6 with 3.0T engine that was silkier and nearly silent on city side streets. I miss that. The E400 V6 engine idle db and low speed deamenor needs improvement. Again, it sounds diesel like and is too loud even with noticeable harmonics with windows shut (at 25mph or under, 40km/h and under speeds) Maybe that's partly why they will switch to inline 6s in future. The power of the twin turbo on the other hand is very good far and away superior and smoother to the E300 (sorry USA), and with lag free torque. I have no complaints about power delivery. Pulls away nice and smooth no peaky torque or delay of power. Yet, you need to move? It's a rocket on demand. Otherwise, the power delivery is for a gentleman as befits a Mercedes. Classy. Fuel economy is very good easily besting my Audi. Nice bonus there. On a road trip (not done one yet) it must be diesel like mileage I surmise with that 9 speed. As an aside: I drove a 2017 Audi S4 with the new turbo 3.0T that replaced the supercharger and it was laggy as hell. The old Audi 3.0T supercharged was their best engine over the last decade. Too bad it's being replaced by an inferior turbo one. I think the twin turbo is key for eliminating dreaded lag and the Mercedes is the better engine for power delivery now. That's about it. Tech is great, too much to talk about. I can do a different review of tech. Quality is exceptional, and car has had zero problems. The engineering is truly astounding and noteworthy befitting a Mercedes and everything you expect from a German car that sets and defines the bar. When you see the car and open the door it's very satisfying and exciting to get in and immerse yourself in this truly world class vehicle (other brands claim world class but that's a joke). IMO only a fully realized effort produces the repeatable emotion of excitement and satisfaction everytime. This car, as many German cars has it in spades on a next generation level. Not an easy accomplishment. But the goal was achieved here. All is well at Mercedes Benz. This is a professional car made by experts with passion. Finally, this car is worth the price unlike many other choices in this price range (mostly non German). Last edited by Mitch105; 05-20-2017 at 08:58 AM. Thanks for the review. I'm hopeful the V6TT will make its way south of the border in a couple of years. Until then, I'll stick with my middle of the road na 6. Excellent review. 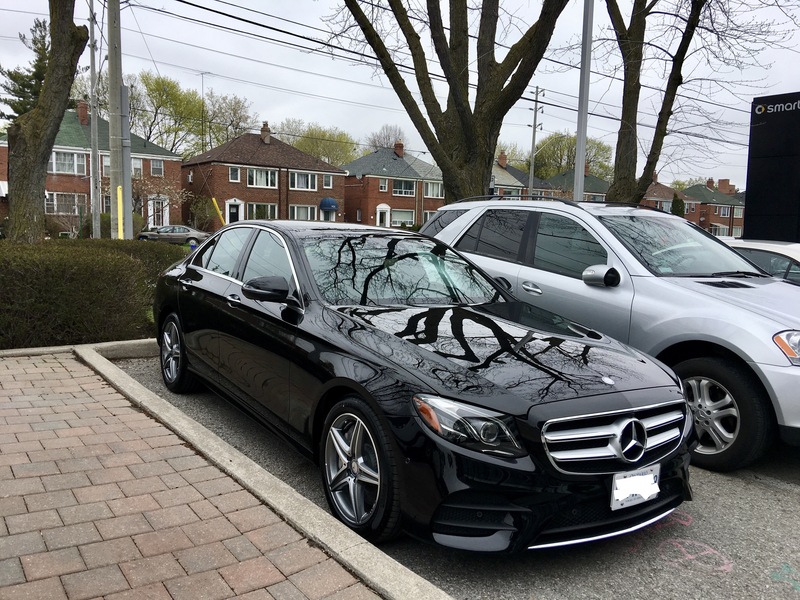 I currently lease a '16 E400 (W212) and prior to that had a '13 B8 S4. Loved the supercharger on the S4 but wanted a bit more room. I love the looks of the W213 but fear the E300 won't have enough punch and I'm not thrilled with the E43. You're fortunate to be able to have the E400 as a choice. I'm still in the break-in phase, but even then I drive like an old man (at 48 getting there). But when I want power, I want there to be smooth effortless power. You need at least a V6 for that smooth refined power IMO. The engine might be a bit loud at low speed but it's still a smooth V6 with beautiful spot on linear power on demand. That's what I paid for and that's what I have; a premium engine in my premium car that makes it special and exciting. I might not drive like a crazy kid but I certainly consider myself a passionate car enthusiast. No 4 banger can live up to that in a car this size and weight. At least not for now until a hybrid comes or some other new electric option appears that makes the V6 less appealing. Last edited by Mitch105; 05-20-2017 at 08:56 PM. Awesome review there! I haven't driven my car past 100km/h yet (it's got only 500km), but I think the car is capable of going very fast. I always get these stares from people, they're like, "Why are you driving so slow in a fast car?" Maybe it's just the 19 inch wheels that's giving them - in this case - the correct message! I drive an E400 myself down under in Melbourne (Exclusive line though, with every option selected but towards comfort instead of sportiness). I'm on 19" rims with RFTs and I thought I was going to complain at first (my C300 in Malaysia has 19" rims with standard suspension and it was awful), but the air suspension made up for it and it really soaks up the potholes and bumps well. Power's good and befitting of the car's size. It does give off a feeling of confidence and Teutonic solidness. But that being said, my GLC43 feels more like an autobahn dominator compared to the E400. Great review. Swap your runflats and the car will shine, I changed my 18 runflats to regular 19 Continental Sportcontact 6 and 19s are way softer and more comfortable. Yes, I have no doubt. My previous Audi had conventional Continental 18s with an inflatable spare under the trunk. The Contis were grippy, compliant and silent. Perfect. Anyway, its such a pain to swap as here in Toronto the dealer offers no solution package. So you have to order the tire inflation kit, purchase separate tires and then eat the 100% cost of the run flats or try somehow to sell them. I, for one, have little time for this kind of fuss. I would be happy to pay my Mercedes dealer a more than fair premium to swap option and just get it done. But, no, its not offered. And, here in Ontario, Canada, its a big place. We have a vast cottage country. Good luck to me and my family if I get a flat 150-200km+ away in the country in the middle of a weekend. No one will be able to help. So there you are in your 17 E400, passed on the side of the road by Jake in a 1997 Chevy with 497,000km and zero issues. I can see it now. Look, I have not actually had a flat in years and years, and the last time I did I was at home in Toronto, but still. Last edited by Mitch105; 05-21-2017 at 11:26 AM. I have had run flats on a couple of BMW's ten years ago. Those were hard riding and really noisy. Hopefully the new ones are better. As far as flats are concerned, you can have a plug installed on a temp basis if there is no tire available. I think I prefer run flats to changing a tire. At least you can drive to a repair shop of some kind. I have a E43 coming. I'm hoping the 19" wheels and air suspension will offset the hard riding tires. Either way, it is what it is and in a few years, all cars will be on run flats. The run flats are better for sure than the earlier ones. Driven those too, very unrefined. These ones are, in fact, acceptable. Good points as long as the flat is repairable to get you through a weekend and make it to a dealer. I'm sure air suspension will we terrific. Not sure if E43 has run flats. Might be conventional and a tire inflation kit. Last edited by Mitch105; 05-21-2017 at 05:28 PM. Most of my punctures are on the crown where the tread meets the sidewall - not repairable. That said, I had to wait 4 days for 2 replacement conventional Michelin Pilot Sport A/S + tires when I hit some road debris late last year. That was in the metro Tampa area! If you've got 1 spare, you may need 2. The 43 has runflats too. Pirelli P0 with an MB specific tread and design. Surprisingly good tires in my short expirience. Smooth riding, quiet and excellent cornering abilities. Only time they feel harsh is on cratered pavement. BTW thats with 20s. I dont know what the 19s are. You have air suspension standard in the 43. I think that makes a big difference for ride comfort. That said, ride comfort is great in my E400. It's the tires. I find runflats have come a long way, and my C43 and my Z06 both have them. Many on the Z06 forum have swapped to regular tires and many did not like it. I think that when a car is engineered with runlfats it certainly helps, as well as with the Airmatic. When I get my E400 wagon, I think it will also have them as well, the whole stable! Toronto has bad roads everywhere so that is a problem. I think air suspension is ideal for my next car but I don't regret not having it on this car. The ride is a bit clompity but not rigid at low city speeds. Thought I should do obligatory pic too. Last edited by Mitch105; 05-21-2017 at 08:27 PM. My build sheet shows E43 tires are run flats. Regarding the acoustic package, I've done some digging around. It is nowhere to be found on the Canadian Mercedes website on E class. Oddly I did see it as an option on model like GLC thought. It doesn't make sense as E class is higher than GLC and it's available in every other market as far as I know including US. My question is if it is possible that it's included as standard? It's odd that's it's not even mentioned. I assume we don't have it but someone had pics of acoustic glass so I guess we can check. There is a sun protection package. Does it include IR glass? The Canadian site doesn't say. I have that package. No I don't think it does. It's just the motorized shade in back and manual read side window. I could be wrong. The package description lists 3 items. The back and side shades are self descriptive, but exactly what is sun protection? Thats its. Roller blinds lol. They are nice. I would like to get those too; is it possible to have the dealer install them when I take my car in for service? Doubt it for the rear power window which is a factory option. Side manual shades I'm sure can be fitted. This basically seals the deal for me. Been debating between this an an A8. I think I'll buy the A8.